Free to all on Saturday 9 September at Cowane’s Hospital Grounds by Stirling Castle with pop up bar courtesy of Stirling Gin serving Bloody Scotland cocktails. At 2pm on Saturday afternoon, while the queues form around the Albert Halls, Allan Park South Church and the Golden Lion with crime fans patiently waiting to see the authors they admire on stage, many are not aware that the Scotland and England squads of crime writers including some huge international stars will be limbering up for their annual grudge match on the bowling green of Cowane’s Hospital. It is a fabulous FREE event which this year will be enhanced by Bloody Scotland cocktails courtesy of Stirling Gin who are setting up a pop up bar and, in the event of rain, made less soggy by a new addition of Bloody Scotland umbrellas. 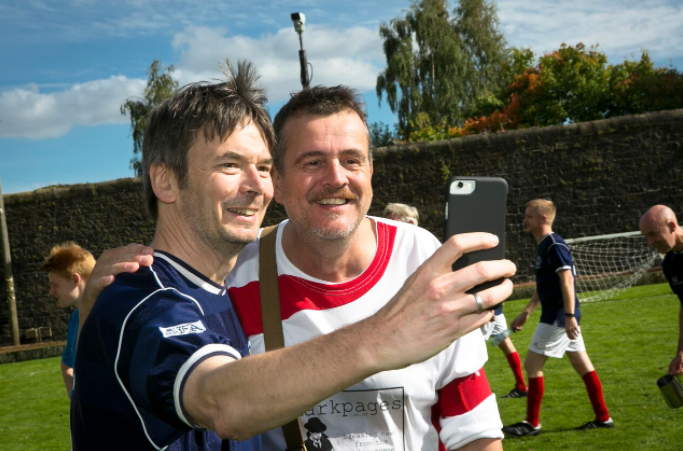 The Scotland team will be captained by Ian Rankin and include crime writers Craig Robertson, Doug Johnstone, Martin Stewart, Peter Mackay, Lloyd Otis, Thomas Enger and publishing types Jamie Crawford, Danny Scott and Neil Macpherson, husband of Catriona Macpherson. The England team will be captained by Mark Billingham and include crime writers Luca Veste, Howard Linskey, Vincent Holland-Keen, Rob Scragg, Matt Wesolowski and literary hangers-on editor, Emad Akhtar, agent Phil Patterson and podcast producer Paul Hirons. The squad selections have been beset by injuries, writing deadlines and demands to see birth certificates. There’s also been much talk of the ‘granny rule’ and just what actually qualifies as a crime novel. Tensions have been growing and it’s safe to say it’s all threatening to kick off. Bloody Scotland has always tried to include the local community by offering discounts to local residents and free tickets to the unemployed. This year outreach has gone one step further encouraging locals who might not normally go to a literary festival to join the torchlight procession on the opening night led by Ian Rankin and Val McDermid and we would like to encourage anyone in the area to join us at Cowane’s Hospital for the chance to get up close and personal with some of the biggest crime writers around as they run around (a very small) football pitch.